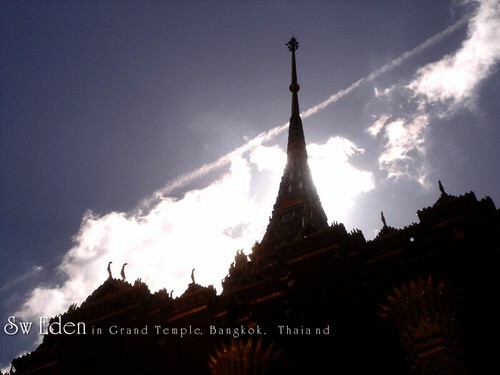 พระบรมมหาราชวัง Grand Palace :I really love the idea of Mixed Architecture. 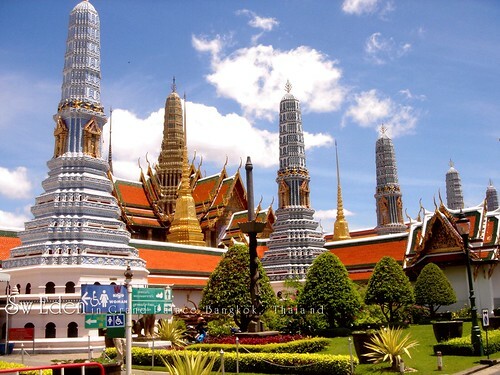 You will see the European building with Thai roof. Very creative and they are so harmony. I have never feel strange or anything. It is just perfect. 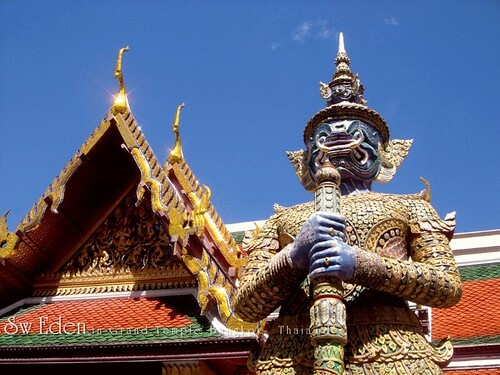 Thailand has Giant to protect the door way. People said the ghost and bad spirit fear the Giant. 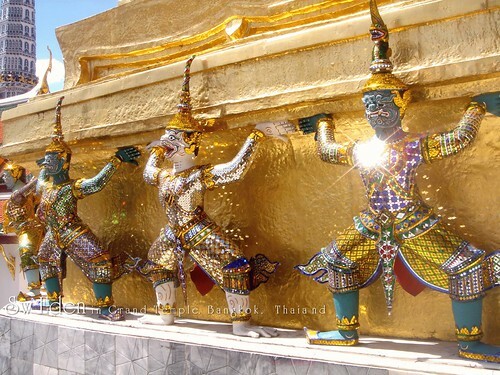 At first we come in to the grand temple or grand palace, we have to see this blank area. Although all around us, there are too many people. The favorite drawing of an France artist who visited my school. I was about grade 7 at that period. 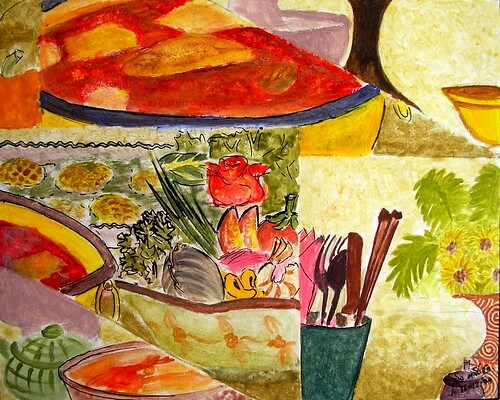 This drawing included the foods in the poem of King Rama II (King Rama 2 , King Buddha Loetla Nabhalai) that is “Verse of Food and Dessert”, composed for singing during rowing the boat. 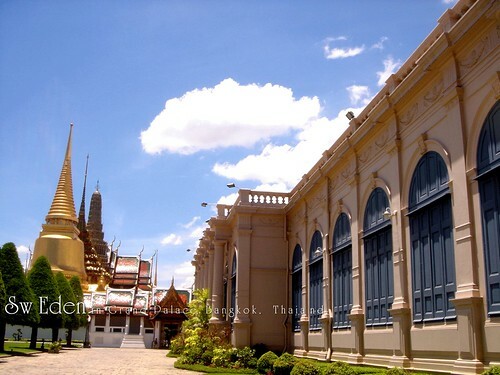 King Rama 2 is considered as a really great teacher of Thai poets. 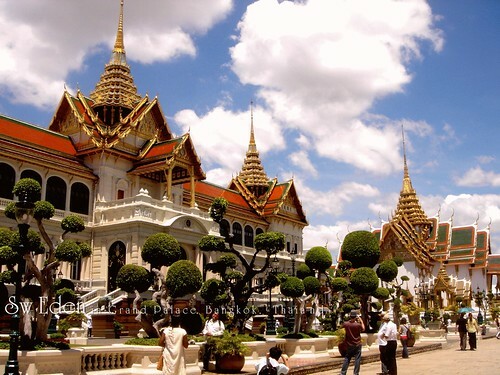 This Verse of Food and Dessert is about how delicious of Thai Food, and a little bit about how to cook. King Rama 2 always compare This great foods with his lover; such as how the food looks like and how the woman dresses, and how happy to eat the food and how happy to be with the lover. All are so beautiful and creative. He is really really artist! He can put many many kinds of food in every individual verse. I guess this poem should include more than 20 kinds of Thai food. I will translate some parts which are so artistic. It will be crazy to translate whole things, so you may get rough translation on Google translate or Babel Fish Yahoo. The kids who much love the father. The kids who had had father’s photos on top of their houses. The kids who cried to glorify the father. Do they still love their father? The Red raise the posters, which are written in France and English, although they cannot read those languages. People said, the Red got paid 1000 – 3000 baths ($30-$90) a day to hail for something they really did not know. They are kids, and we should forgive them. They do not know that they hail for the rebel. They got paid and they do it without thinking. Just like the act of the kids. A bad adult gives them the money to buy a sweet candy, and their teeth get decayed. They love that adult, and they do not know why they have decayed teeth. As good adults, we should forgive them, and give them a chance to be nice kids again.